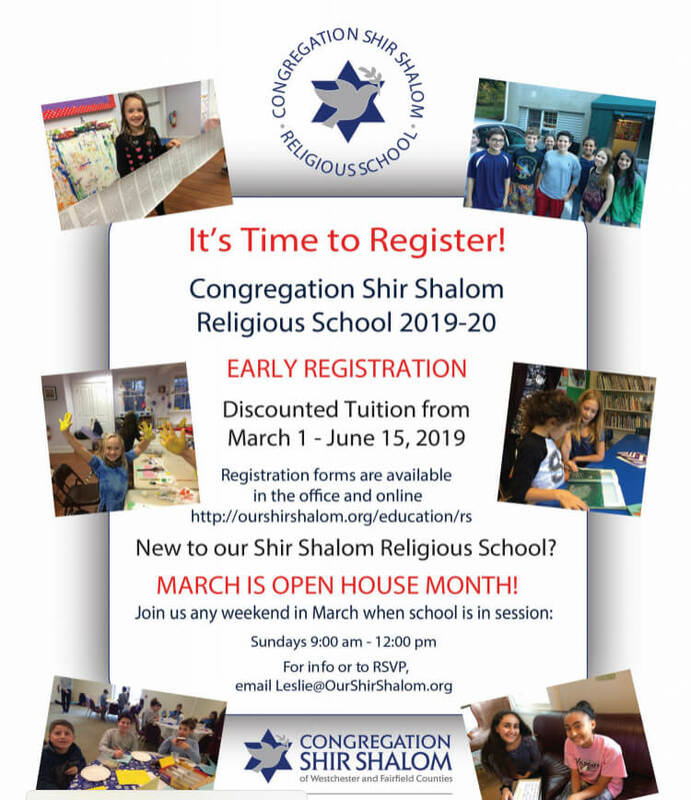 What makes our Religious School at Congregation Shir Shalom so special? We believe it is the relationships our students make as part of our Religious School. Our strong bonds among teachers, parents, students and clergy all meld to reinforce the shared goals of our school and congregation. Teaching and learning is fun and meaningful for all because of these strong connections, a sense of community and purpose. Our students and families not only learn Jewish traditions, culture and Hebrew but develop lifelong friendships. Small class size helps us get to know our students in a very personal way. Our emphasis on student and family programming that values relationships makes us unique. Students in grades K-12 attend classes once a week. Students in 7th grade (B’nai Mitzvah year) attend twice weekly. Our optional Grades 4-6, no additional fee Wednesday Enrichment Program, offers students extra review time and enhanced learning opportunities. It is a supplementary program for students who have missed class or need more personalized attention with the course work. It also is an attractive way to help new students get the extra support needed to fully integrate into our program. 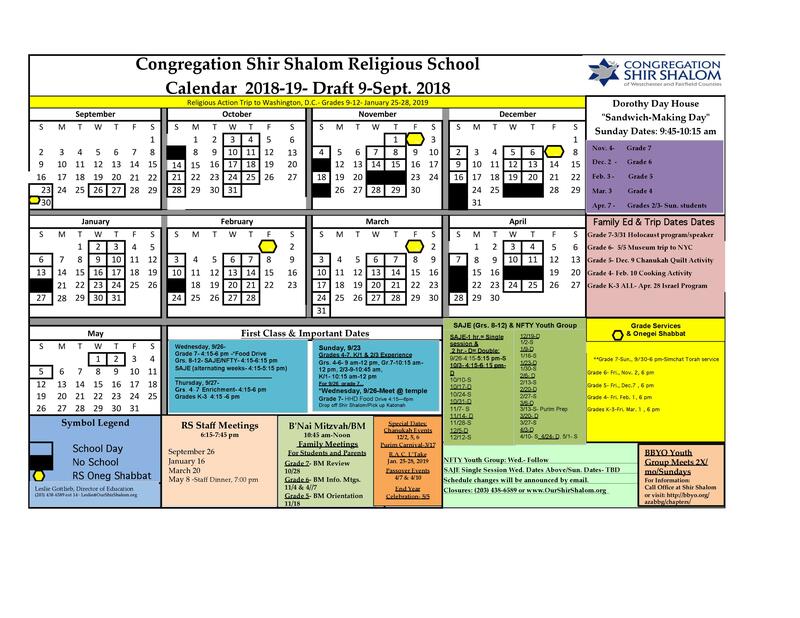 Our rich curriculum, developmentally appropriate for each grade level, includes lessons in Jewish culture, holidays, traditions and thoughts, Hebrew and prayers, understanding the Shabbat service and topical issues. Through hands-on projects, special events, trips, art and cooking activities, Jewish dramatic arts, social action programs and much more, students will gain knowledge of their Jewish heritage in an effort to help create strong Jewish identity. Students are recognized at year’s end for attending the same number of Shabbat services at Shir Shalom as their grades. This program helps to reinforce the temple and community relationship with the school. Our unique Mentor, Leader and Volunteer Programs encourage trained high school aged students to be teachers and general assistants. These programs benefit our high school aged students, our younger students, the classroom teachers, and they also act as role models for our younger Religious School students. We offer interactive family education programs for all grades to integrate families into our program. There are many opportunities for families and siblings to join us for special occasions and for RS services every day of the week school meets. Our teen SAJE program (Social Action as Jewish Education for grades 8-12) formally recognizes students for a commitment of at least two years to the program and are encouraged to participate throughout their middle and high school years. Our professional staff of teachers– including a team of high school Mentors, Leaders and Volunteers, all help to provide a strong foundation for our school.